As host of the 2019 Rugby World Cup, Japan has begun a worldwide marketing campaign to encourage tourism and bring more visitors not only for sport, but to discover its culture and explore its history and traditions. 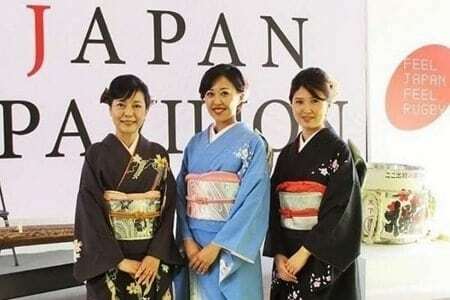 The Japan Tourism Agency needed a venue in London which could host a three-week exhibition of Japanese culture, to coincide with England hosting the 2015 Rugby World Cup. The organisers wanted a combined indoor and outdoor space where a pop-up marquee could be installed in an area with high footfall and visitors could come and go freely throughout the day. Being situated in the heart of London, opposite Westminster Abbey and a stone’s throw from the Houses of Parliament, QEII benefits from a high level of footfall throughout the day, which made the green outside the building the perfect place for the Presenting Japan marquee. With the help of promotional staff enticing passers by the exhibition drew large crowds who were then signposted to head inside and see what more was on offer on the second floor. We were able to use our remodelled foyer to set up a registration desk for organisers to keep track of visitors throughout the duration of the exhibition, and our friendly front of house team helped to guide people in the right direction to visit the second floor exhibition. Our flexible indoor space was used to accommodate a wide range of activities, from kimono tying workshops and sake tasting to a rugby pitch photo booth where visitors could imagine the exhilarating feeling of scoring the winning touch-down in a world cup match. The marquee hosted themed interactive displays and workshops covering different aspects of Japanese culture, including ‘sport for tomorrow’, ‘technology with heart’, ‘cultural food’ and ‘timeless creation’. Erecting a marquee on the green wasn’t without its challenges, as even a temporary structure needs planning permission and it was something completely new to the centre, but a combined effort by our team and the organisers meant all the necessary permissions had been granted in time for the launch. The Presenting Japan exhibition was an opportunity for us to show how the centre can be used for public events as well as ticketed conferences. It also gave us a chance to showcase the centre to new visitors and make the most of our outdoor space. There was constant footfall throughout the three-week exhibition and the interactive elements helped to reinforce QEII’s position as more than just a conference centre. Presenting Japan demonstrated that we are an extremely flexible venue and we welcome creative ideas from event organisers – all of our team are up for the challenge of turning ideas into reality.